Mindroutes: WHAT'S WRONG WITH CROSSRAIL 2/CHELNEY? The Chelesea-Hackney line was conceived decades ago as a way of linking two inner London areas (Chelsea and Hackney) into the tube network. Despite relatively high population densities and their central locations, they had been overlooked ever since the Underground started its life over a century ago. The safeguarded route (see image) shows the line passing through central London then onto two existing lines - the District Line to Wimbledon and the Central Line to Epping (both on the LU network). Although initially conceived as a LUL line like any other, the idea was taken over by the same group that conceived Crossrail 1 and the idea took root that this line too should be built to Crossrail standards. For those unaware, the Crossrail is in concept an express, long-range, heavy metro line that bores through the centre in tunnels and extends far out to suburbs and peripheral towns on the surface. It is closely based on the RER system in Paris. An "underground" line, by contrast, would ordinarily have no interurban pretenses, lighter infrastructure and greater station densities, without express facilities. The Crossrail/RER advantage lies in the relief of congestion it would provide at rail termini, as it distributes commuter traffic closer to their final destination, whereas normally they would be funneled onto and off the underground network at very high density. It also provides the potential for much quicker intra-urban journeys. 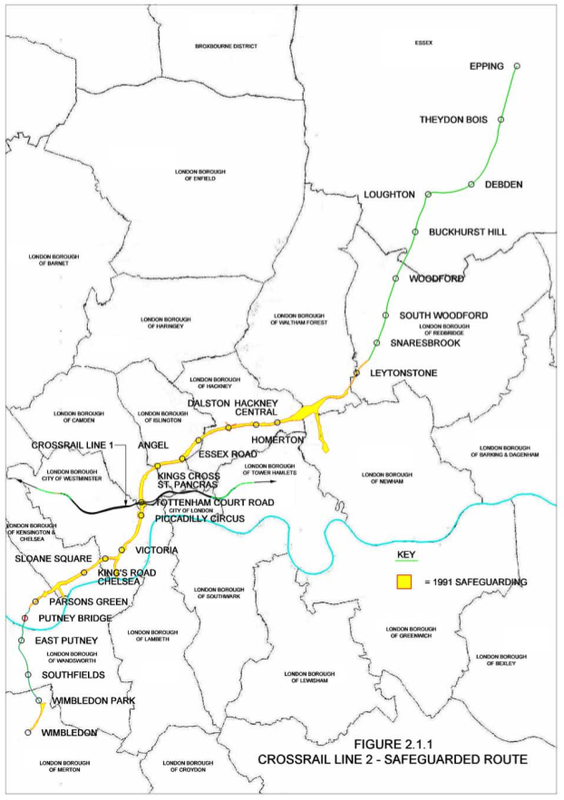 The line would serve existing national rail lines in Hackney and add one new underground station in Chelsea, providing benefits to those areas. Currently it is caught between two concepts and can't decide which one it is. In its current form it has the profile and expense of a heavy Crossrail line and the lower station densities, but the range of an LU line (Epping to Wimbledon). Until extended routes are published onto say, SWT rails, or East Anglia trains out to Chelmsford. The main flaw in the concept is that it provides a grand total of one new station to London. ONE! One station for Chelsea, which urgently requires two or three. Its central route doubles up capacity between Sloane Square and Victoria (is this really necessary?) and merely joins the dots through central London's same old stations which are set to become major, passenger-unfriendly labyrinths. In this profile the inclusion of both Piccadilly Circus and Tottenham Court Road stations seems ridiculous. The Crossrail stations are enormous, with platforms over 250m long. The cost of a scheme like this is immense, much more than a normal tube line, since stations have to be much bigger. Don't believe what the experts project. You usually have to multiply this figure by 6! Immense cost, for the luxury of having an alternative route between Wimbledon and Epping, and one new station in Chelsea! Does it make sense? Chelney aka Crossrail 2, like Crossrail 1, would provide a major capacity increase, and faster cross Central London travel times. Hence I disagree that new Chelney stations in Central London is a major flaw. Capacity & connectivity to the existing Underground network are key.